Mahatama Gandhi Chitrakoot Gramodaya Vishwavidayalaya, Chitrakoot madhya pradesh established by the Government of Madhya Pradesh through legislature by an Act (9, 1991) on February 12, 1991. has issued a notification for admission to Distance education. MGCGV offers UG, PG and diploma courses in various fields. Interested and eligibility candidate must fill an online application form and submit it before the last date. Details regarding Application form, Eligibility criteria and selection criteria are given below. Candidates seeking admission in various courses can fill their Application form from here and can be submitted on or before the last date of application. The candidate may please note that there is no age limit. Candidates who satisfy the below criteria can apply. Schedule for MGCGV Distance Education 2017 is given below. The application process for MGCGV Distance Education 2017 has been started. Candidates have to apply and submit the online application before the last date i.e November 30, 2017. The MGCGV has re-extended the date for submitting the application form until January 15, 2018. However, now candidates who wish to register have to pay late fee of Rs. 500/- and January 31, 2018, with late fees 1000/- Candidates are advised must ensure that they are eligible or not and provide authentic details only. Apply here: Click here to apply online for MGCGV Distance Education 2017. Candidates have to send completely filled application form along with application fee and required documents in the university office. 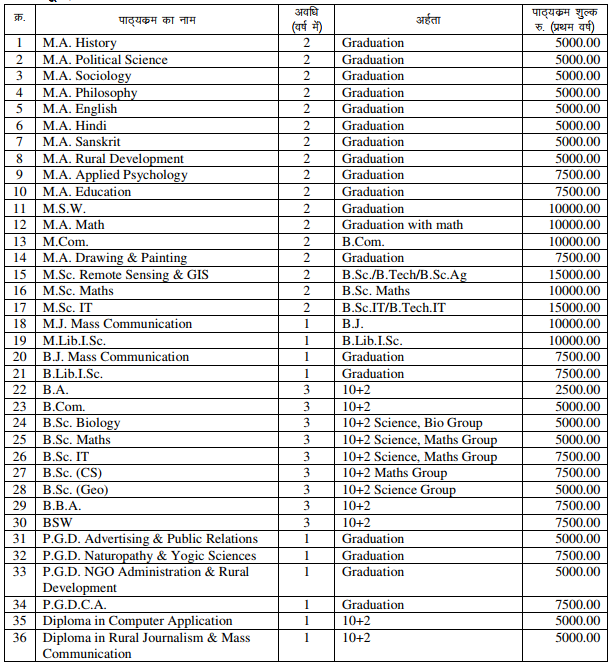 Eligibility criteria and fee structure for various programmes are given below. For any query candidates can contact to the below No and email ID.